Four women from Wits have placed second in the 2017 GirlCode hackathon. Meriam Elabor, Tsitsi Marote, Mamello Maseko and Sarah Wookey represented Wits at the 2017 GirlCode hackathon. 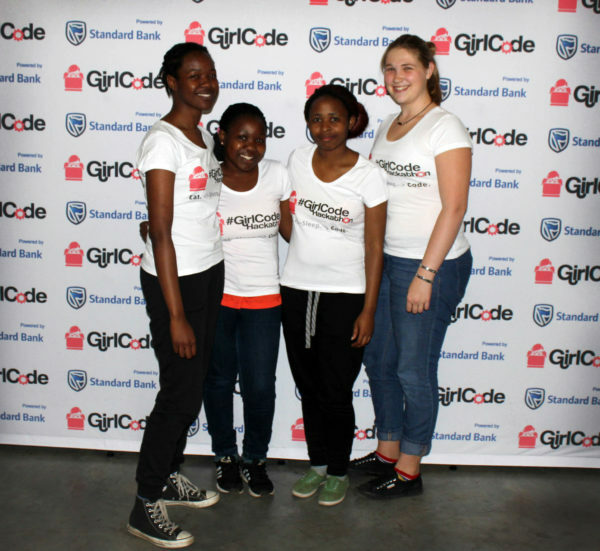 A Wits team, comprising four female BSc students, walked away with a R20 000 study voucher after placing second at the annual GirlCode hackathon, which was held from August 5 to 6. The Wits team, comprising Tsitsi Marote, Sarah Wookey, Meriam Elabor and Mamello Maseko, made an app that works like a buddy system to help students motivate each other to complete their university assignments. Students earn points for every assignment they complete. The app also connects university divisions, such as the Wits Counselling Careers and Development Unit (CCDU), so they can monitor students’ progress and provide students with personalised career and study guidance. The women-only event involved 20 teams of junior developers from the various higher education institutes in South Africa, including We Think Code and the University of Johannesburg. The Wits team present their app to the judges. Each team was given 30 hours to programme a website, app or game that provided a solution to one of five prescribed problems. The problems, which were outlined by GirlCode, focused on government, social welfare and productivity. According to Wookey, the coding process was not easy and “the event definitely put a little pressure onto my skills, but we just eased into it and it’s been good”. Marote told Wits Vuvuzela that the team was happy to have been placed in the top three of the competition, “We weren’t actually expecting it, so it feels really good, we’re very honoured to have done so well,” she said. The winning team from the University of Cape Town won a trip to Silicon Valley in the United States, where they will visit large information technology companies, such as Google and Microsoft. The R20 000 study voucher won by the Wits team can be used to pay for further studies in a field of their choosing. 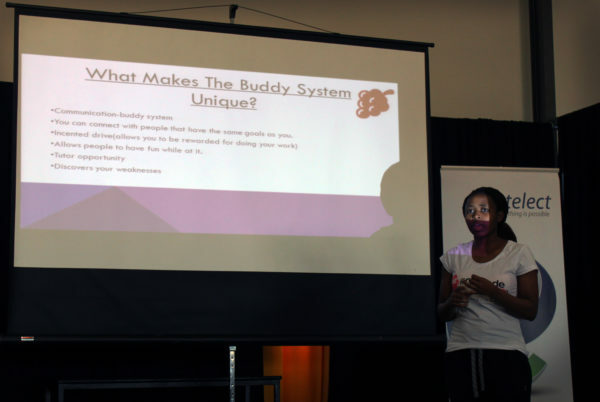 GirlCode is a non-profit organisation, founded by Jeanette Theu, Zandile Keebine and Tinyiko Simbine, that focuses on “reaching out to other girls, building a community and helping each other get mentors, so it’s all about helping each other out”, says Theu. Women constantly face stereotypes within male dominated fields, such as information technology, and “we are trying to break the stereotypes and say ‘actually there’s female developers that code way better than guys and by saying females only look at the pretty things, that’s kind of demeaning’”, says Theu. According to competition judge and technology journalist Nafisa Akabor, events such as the hackathon are important as “there aren’t a lot of women encouraging women to do this, so a platform like this helps young women decide that this is a viable career option”.